The Chicago Foodie Sisters got invited to a recent "Discover Fresh" tasting at the Aurora location to get a sneak peek of upcoming menu items and get a look at all the farm fresh option at the buffet restaurant chain that has over 120 locations across the country. At top is the popular Big Chunk Chicken Noodle Soup, and moving downward, the Cream of Mushroom Soup (available one week per month) and the limited-time May special recipe of Albondigas Locas. So, Becky and I headed out for lunch ready to try out the many soup and salad options and see what else was waiting. Becky had been to Sweet Tomatoes on a couple previous occasions, but not in recent months and for me it was my first visit. I've had it on my long list of places to try ever since my hair stylist, Dana, recommended it. She said that she visited the Aurora location when her daughters had sporting events in the area. Becky and I are fans of soups and salads, so I was certain there would be a lot we would like. We got a little overview as we walked in about the San Diego based company that has been doing "Farm to Fork" from the very beginning. The entrance opens right into the buffet, so you simply grab a tray and plate and start picking out what you like. Green-based alads are tossed every 20 minutes to ensure that the lettuce is fresh and there's plenty there. Wonton Happiness and Caesar Asiago are two of the ongoing offerings and then there are limited-time recipes, as well. Several of the dressings are house-made. The potato salad features fresh herbs. 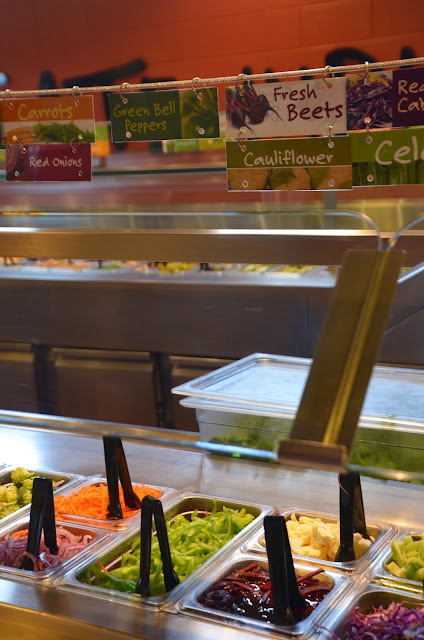 Everything is replenished frequently, so it was all fresh and crisp and the salad bar area was very clean. One thing you don't want to pass up as you go down the line are the dill pickles made in California by County Fair Pickles. 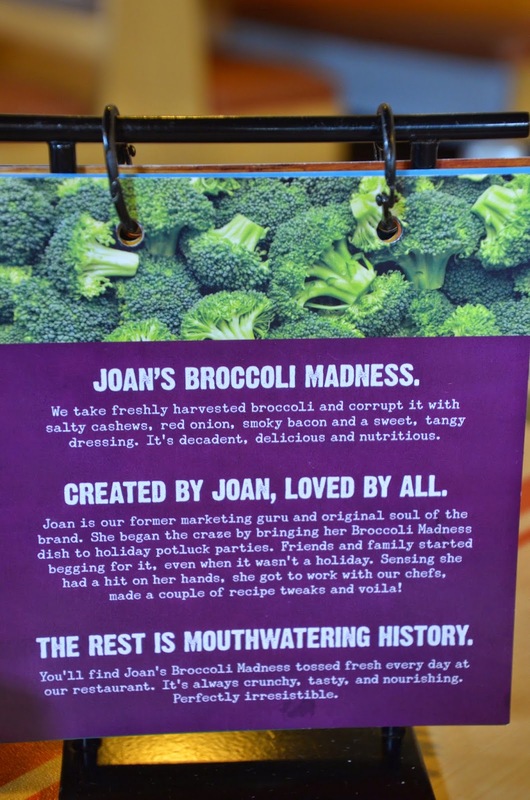 Among the prepared salads are the popular Tuna Tarragon and Joan's Broccoli Madness. They are always on the menu with two more rotating salads, all made at the central kitchen in Chicago (the company has 17 in all across the country.) All baking is done on site. The beverage options are many including four lemonades. The fresh strawberry lemonade is super refreshing. Hot teas and coffee are also available. After you make your way through the salad bar, you pay for your meal, which will run you $9.29 for a weekday lunch, $9.59 for a weekend lunch and $11.29 for dinner and $3.99 for a child ages 3 - 6 (with milk or juice included.) An unlimited beverage is an additional $2.49. 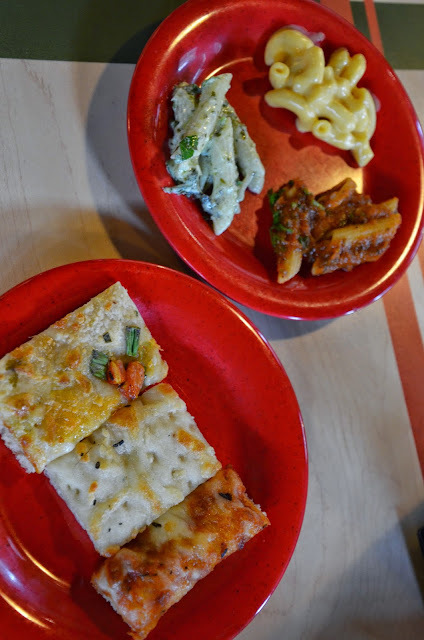 Then you move on to the pastas, soups, flatbreads and desserts. A row of soups await you and there is always at least one vegan option in the bunch. If you are a fan of chicken noodle soup, I highly recommend a visit. This may very well be the best chicken noodle soup I have ever tasted! The noodles, which cook in the broth, come from a company that started 43 years ago with a couple college guys making their own noodles. They've been supplying Sweet Tomatoes locations with noodles for more than 20 years now. The simple recipe includes just flour, egg, water, milk and salt. No ingredients you can't pronounce, just simple and pure - the way food is meant to be made. The noodles are light, yet plump and kind of reminded me of the dumplings our mom made when we were younger. Oh, and then there a HUGE chunks of white meat. Just super, duper yummy! 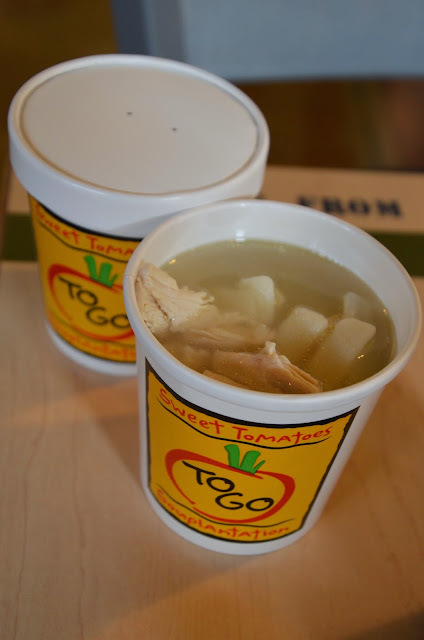 Next time someone in your family is feeling under the weather, head over to Sweet Tomatoes for a container of Big Chunk Chicken Soup to go. They'll feel better in a jiffy. Becky and I both agreed that it was our very favorite item we had that day. Among the other soup options (8 in total) while we were there were the Chicken Jalapeño Tortilla and the Albondigas Locas, a popular Mexican soup that includes chicken meatballs that was making an appearance in May for Cinco de Mayo. The Cream of Mushroom has been so highly requested that it shows up every month for a week to keep the clamoring masses happy. 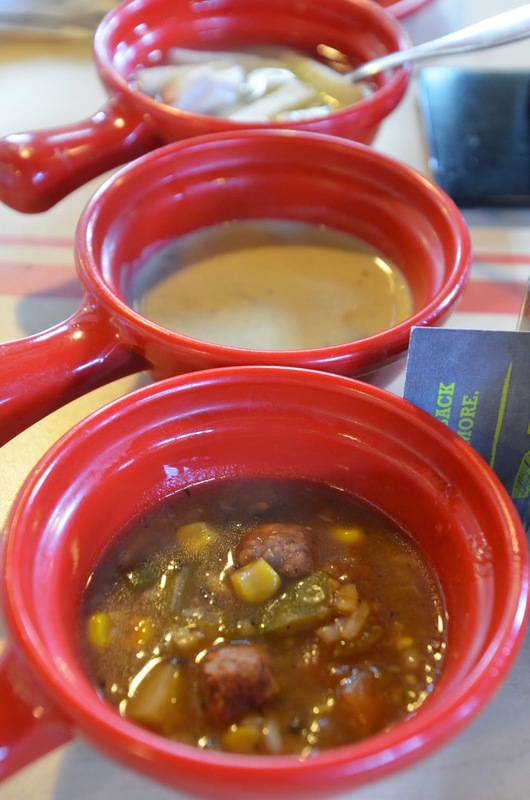 Big Chunk Chicken Soup and Deep Kettle House Chili are always on the menu. 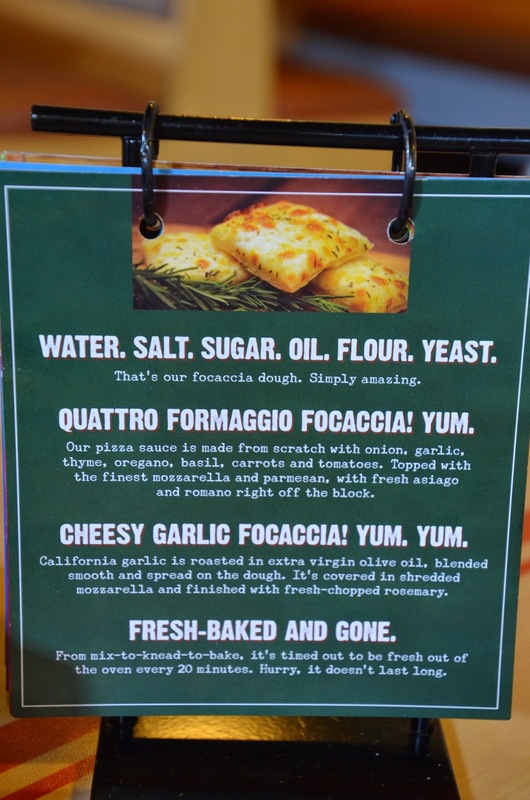 Moving along you'll find foccacia breads that are similar to a flatbread pizza. Quattro Formaggio and Cheesy Garlic are standard flavors along with some rotating ones, like the Tomatillo Foccacio which was also featured for Cinco de Mayo. The fresh strawberry muffins will soon be added to the menu at Sweet Tomatoes. Among the baked sweet treats were muffins: blueberry, chocolate chip and buttermilk cornbread were on the menu that day. We also got to try out the strawberry muffins before they made it into the rotation and they were spectacular! Oh, and don't pass up the sourdough bread and be sure to slather it up with the honey butter. 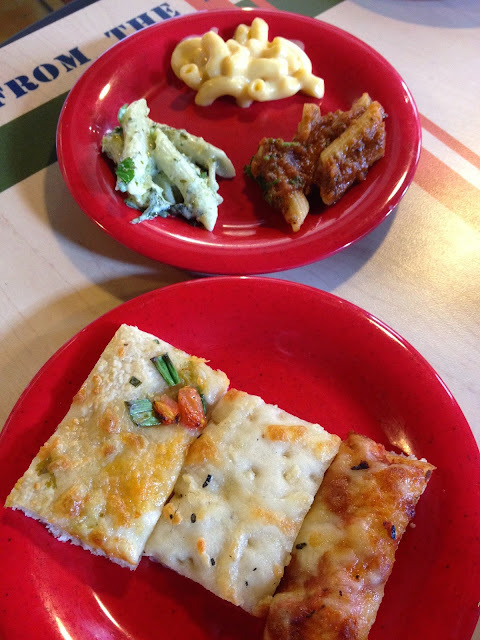 Pastas are refreshed every half hour (or sooner) and the popular mac and cheese is a regular item. Among the others were tried were Roasted Egglpant Marinara, Creme Cilantro and Lime Pesto. Each one was delicious. Oh, and there is also a baked potato bar. Love that idea. Can't say I had room to try it, but who doesn't love a big loaded spud? The dessert bar no longer includes nuts, so those with allergies can indulge without worry. 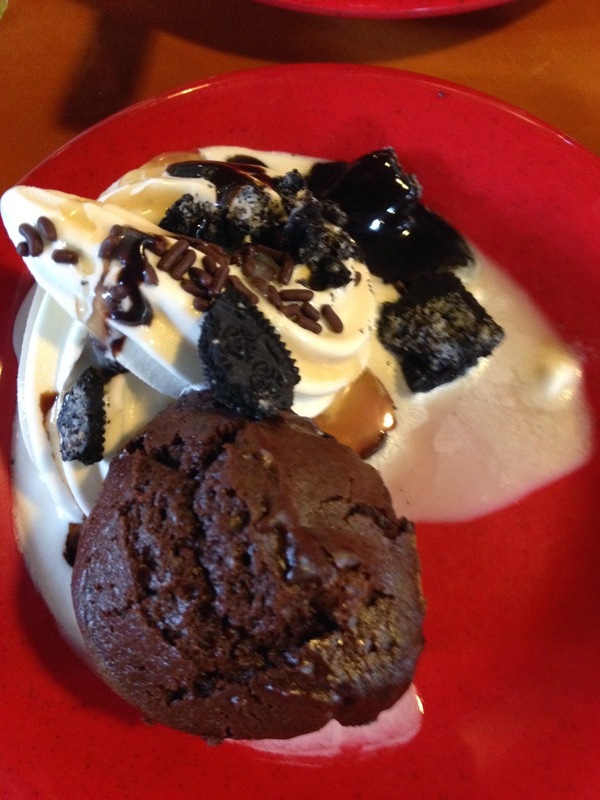 Soft serve ice cream can be dished out or you can do it Chicago Foodie Sister-style and grab a brownie, top it with ice cream then add some chocolate syrup and caramel. Or there are the most adorable little cones that are just the right size after you'll filled up on the healthy stuff. We appreciated how well marked everything is, so that if you aren't quite sure, you can just peek at the label. Chicagoland locations include Aurora, Glenview, Lombard, St. Charles, Waukegan and Schaumburg. Visit SweetTomatoes.com for more details. 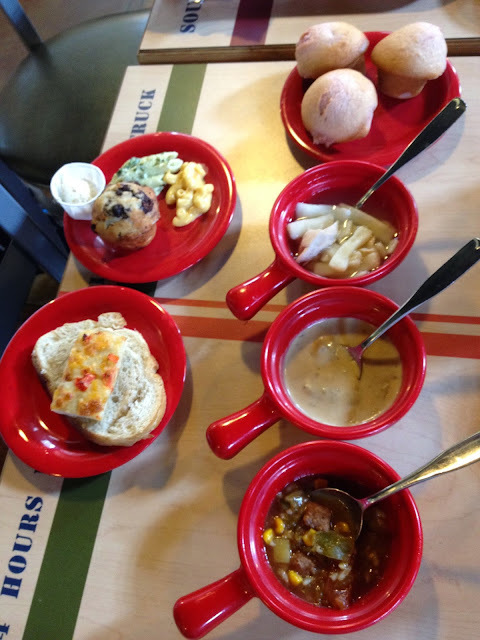 Oh, and be sure to peek online before you go for limited time dishes and the current soup line-up. A To-Go station is at the entrance where you can grab a container, fill it up and quickly be on your way. Great way to grab a healthy dinner when you are busy or grab some soup for someone who is under the weather. **Disclosure: A complimentary meal was provided. Opinions are my own.